I’m a big fan of young adult novels. There’s something about disappearing back into the types of books I read growing up. Plus, they’re quicker reads, which is super helpful when books like The Autobiography of Henry VIII are taking me forever to finish. Did you know that there was a follow up to Holes? 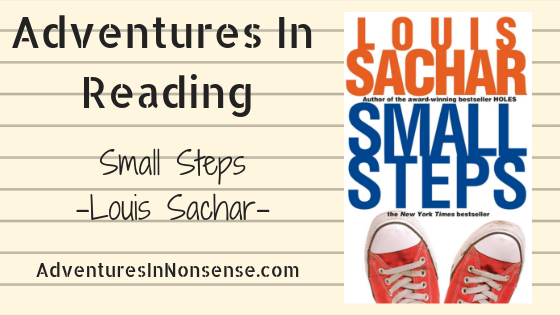 Louis Sachar wrote Small Steps, following some of the more minor characters from the novel turned movie. Small Steps primarily follows Armpit, though he’s working to embrace Theodore now that he’s no longer at Camp Green Lake. Theodore is taking small steps to turn his life around, ditching the name Armpit and graduating from high school among them. X-Ray is still in Theodore’s life, though not in the best way. One day, X-Ray has the brilliant idea to purchase some concert tickets to scalp locally as a way to turn a pretty quick profit. Theodore asks for a couple to take his handicapped neighbor to see her favorite musician, but it turns out that X-ray made his pair counterfeit. At the concert, Theodore is profiled and almost arrested. However, Kaira, the performer, asks for them to be brought backstage. They develop a relationship, and things progress from there. Yes, this young adult novel had a twist! Well, if you count a twist as something you didn’t really believe was necessary to the conclusion of the novel. They used Theodore as a scapegoat for an awful plan, but were thwarted luckily. I really loved Holes. For me, Small Steps was engaging and a quick read, but I don’t feel it was a necessary continuation of the Camp Green Lake story. Note: This post contains affiliate links, so I may receive a small commission from sales generated, at no cost to you! Thank you for supporting me.